The progress in women’s rights brought about by the feminist activism of the 1960s through the early 1980s is today confronted with a major political backlash. 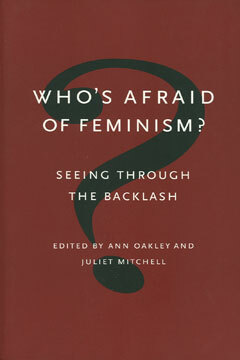 For Who’s Afraid of Feminism?, editors Ann Oakley and Juliet Mitchell have commissioned new work by Carol Gilligan, Carolyn Heilbrun, and a distinguished, international group of feminist thinkers to explore the diverse territories that feminist thought and activism have affected over recent years, and the new questions that have arisen during that process. Juliet Mitchell is a psychoanalyst and is currently a professorial research associate at the University College London Psychoanalysis Unit.